Late of Brisbane formerly Albany WA. 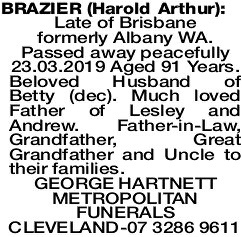 Passed away peacefully 23.03.2019 Aged 91 Years. Beloved Husband of Betty (dec). Much loved Father of Lesley and Andrew. Father-in-Law, Grandfather, Great Grandfather and Uncle to their families.